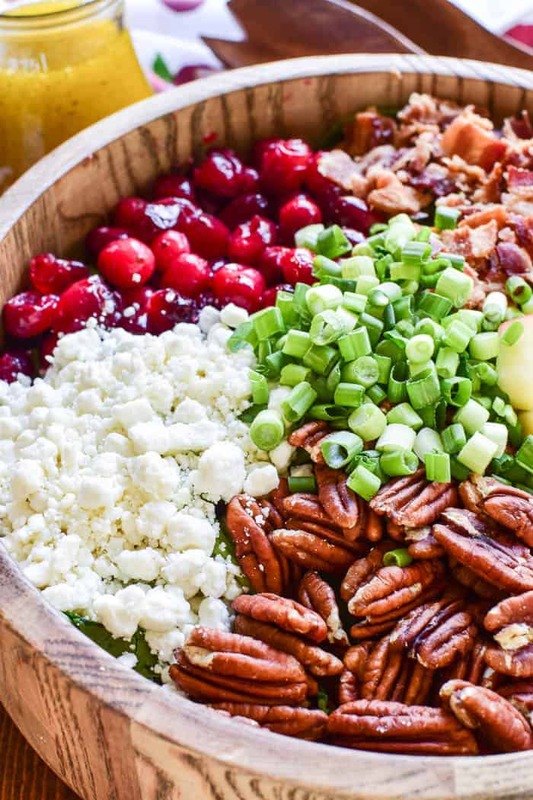 This Cranberry Apple Pecan Salad is one of our favorite fall salads! It’s a delicious blend of sweet and savory flavors, and perfect for the holiday season. 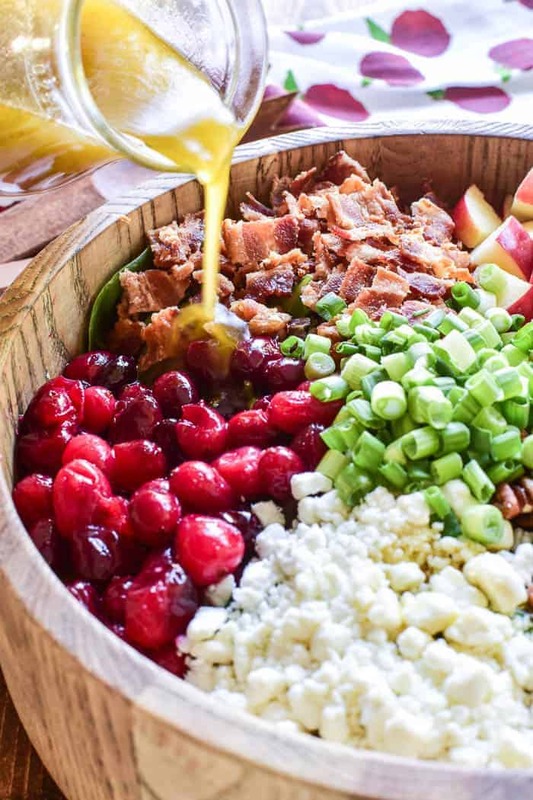 Loaded with sweet apples, fresh cranberries, crispy bacon, crunchy pecans, goat cheese, green onions, and a light vinaigrette, this fall salad makes a beautiful and delicious addition to any holiday meal. Whether you’re hosting a get together or just in charge of bringing the salad, this Cranberry Apple Pecan Salad is guaranteed to become your go-to recipe. It’s easy to make and always a hit! I don’t know exactly why, but I’m really good at letting the holidays creep up on me. I did it with Halloween, and then with Thanksgiving….and now I’m 99% sure I’m doing it with Christmas, too. I guess it’s an avoidance tactic, right? Because the holidays are stressful….and there’s so much to do to get ready for them. So instead of facing it head on, and actually getting things ready, I choose to just not think about it. To be fair, I have given it some thought. I do have a few Christmas decorations up. And I have done a tiny bit of shopping. And I’m clearly already thinking about food…(when am I not!? )…with this yummy Cranberry Apple Pecan Salad. Now, I know you’re probably wondering who actually cares about salad at Christmastime…but if you ask me, it’s an essential part of the meal. 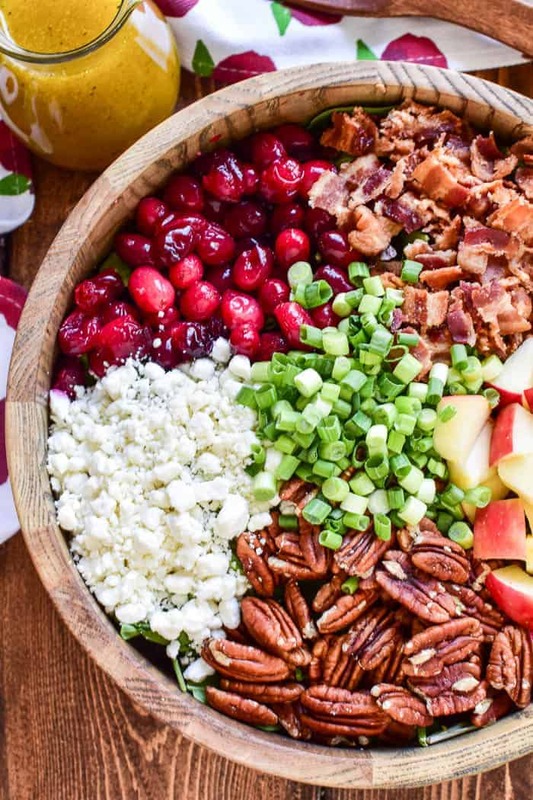 And between the gorgeous colors and the delicious flavors of this Cranberry Apple Pecan Salad, it really is the perfect addition to any holiday table! So as soon as I saw fresh cranberries at Pick ‘n Save, you better believe I grabbed a few bags. And with their amazing selection of apples? This Cranberry Apple Pecan Salad was a no-brainer. Made with mixed greens, honeycrisp apples, fresh cranberries, crispy bacon, pecans, goat cheese, and green onions, this salad has it all. A little savory, a little sweet, and a perfectly delicious homemade vinaigrette to top it off. HOW DO YOU USE FRESH CRANBERRIES IN A SALAD? The key to using fresh cranberries in a salad is to cook them slightly first. Not only does this soften them, but it helps to reduce their tartness. To cook fresh cranberries, simply combine 1 c. cranberries, 1/4 c. water and 1/3 c. sugar in a small saucepan. Heat on medium-high heat until cranberries begin to pop. Remove from heat and cool, then add to your salad. WHAT KIND OF APPLES DO YOU USE IN A SALAD? You can use any type of apple in a salad, but they key is to balance the flavors. For this salad I chose to use honeycrisp apples, which are sweet, to balance out the flavor of the cranberries. WHAT KINDS OF CHEESE CAN YOU USE IN PLACE OF GOAT CHEESE? Any other soft, crumbly cheese would be a good substitution for goat cheese. My top choices would be feta or blue cheese, but you could also use parmesan, swiss, or even cheddar in this salad. HOW DO YOU MAKE A BASIC VINAIGRETTE DRESSING? In a small container with a lid, combine 1/2 c. olive oil, 1/4 c. white balsamic vinegar, 1 1/2 Tbsp. honey, 1/2 tsp. dijon mustard, 1/4 tsp. pepper, and 1/8 tsp. salt. Shake vigorously until ingredients are well blended. For more recipe inspiration, you can find Pick ‘n Save on Facebook, Twitter, YouTube, and Pinterest. 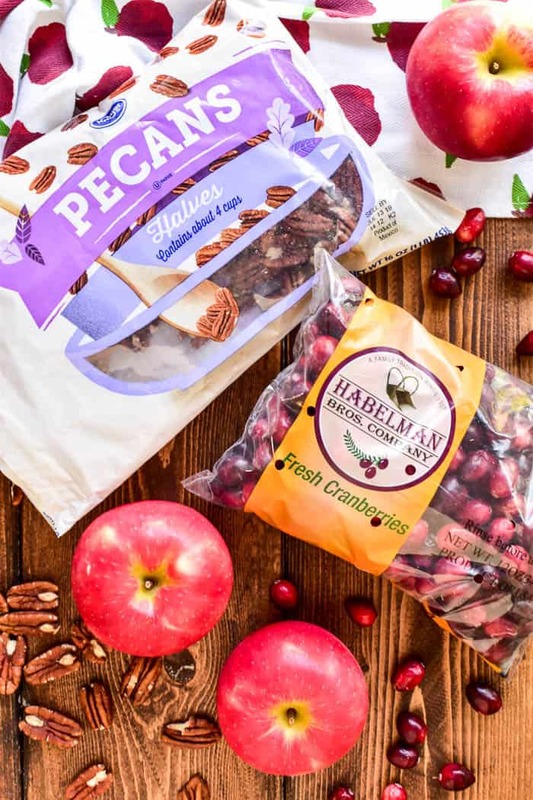 This Cranberry Apple Pecan Salad is one of our fall favorites! It's a delicious blend of sweet and savory flavors, and perfect for the holiday season. 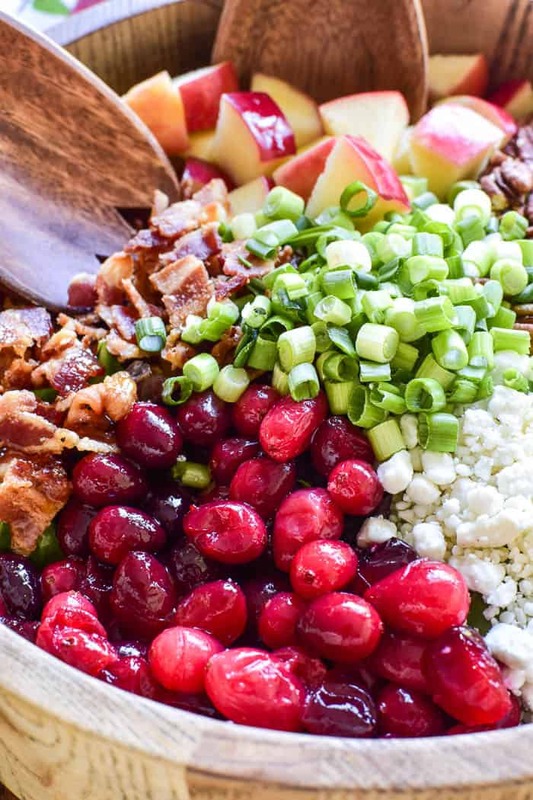 Loaded with sweet apples, fresh cranberries, crispy bacon, crunchy pecans, goat cheese, green onions, and a light vinaigrette, this salad makes a beautiful and delicious addition to any holiday meal. Prepare cranberries by combining fresh cranberries, sugar, and water in a small saucepan. Heat on medium-high heat until cranberries begin to pop. Remove from heat and cool. Prepare dressing by combining ingredients in a small container and shaking well. Set aside. Spread salad greens in a large salad bowl. 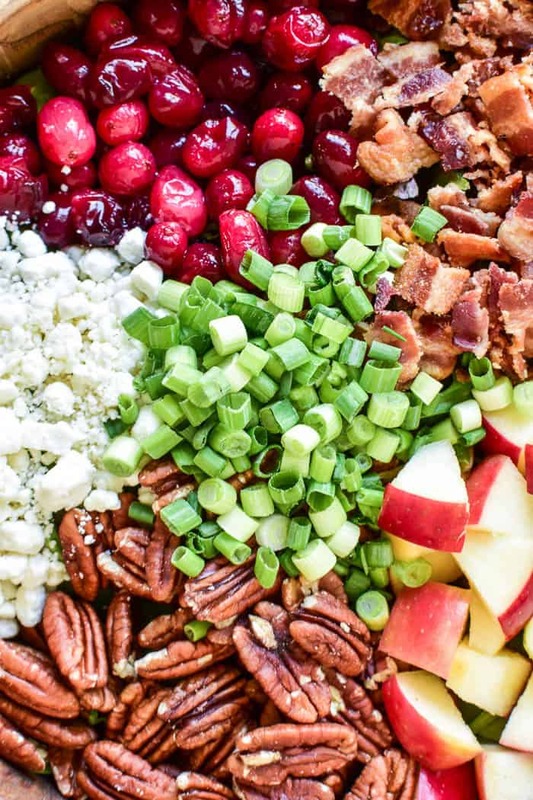 Top with prepared cranberries, chopped apples, crumbled bacon, pecans, goat cheese, and sliced green onions. I love the combination of flavors in this salad! Such a pretty dish! You’ve hit it out of the park with this salad! Loving the cranberries in it! Great idea for a salad! Saving to make soon! This is absolutely awesome! So festive and gorgeous, looking forward to trying it! This is my kind of salad! Loving all of the flavors! I love everything about this salad! Looks really flavorful! Recipe looks delicious….geeze the advertisements are hogging the lime light. Greens? Do you mean salad greens mix, also looks like green onions??? Salad greens and green onions are two different things. Greens go in the bowl first then the rest is placed on top including the green onions. I might add a bit more color by adding some roasted corn.